The 2010 FIFA World Cup scheduled to take place June 11th June through July 11th is the first to be held on the continent of Africa. 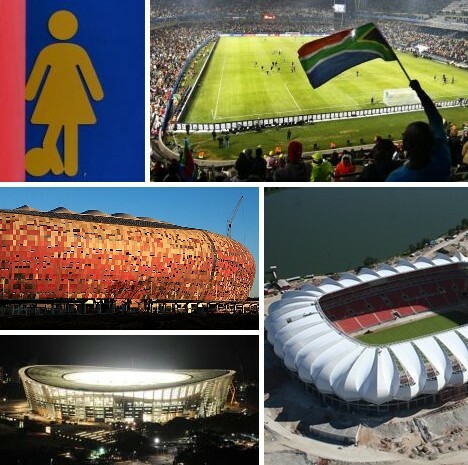 Though many have expressed doubts that South Africa can successfully host an event of this magnitude, an in-depth look at the 10 spectacular stadiums selected as game venues is sure to surprise and impress sports fans the world over. 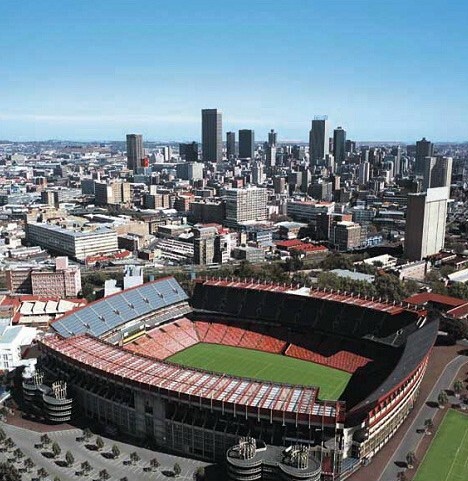 Opened in 1989 after a 3-year-long construction period, the Soccer City stadium is famous for being the site of Nelson Mandela’s first major public speech in Johannesburg following his release from prison. 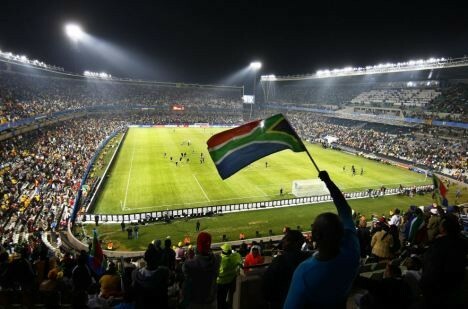 The stadium is located in Soweto township and originally had a capacity of 80,000 but a major renovation undertaken in 2008 to prepare for the World Cup saw capacity rise to 94,700 – making it the largest sports stadium on the African continent. 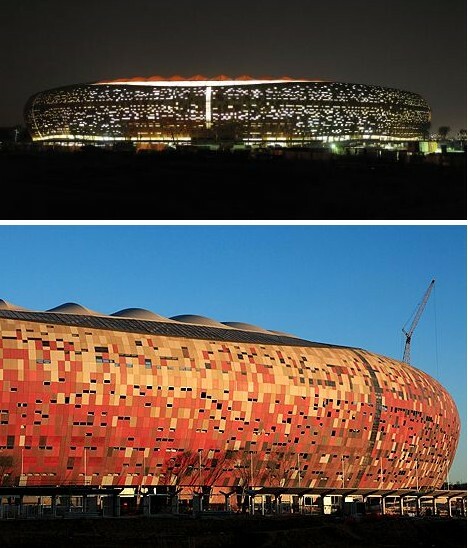 The new design of the Soccer City stadium is meant to evoke a traditional native ceramic cooking pot, with a ring of lights encircling the outside base to evoke the appearance of a cooking fire. The design meets practical as well as cosmetic concerns, as no seated spectator will be more than 100 meters (330 ft) from the playing field and no seat will be hindered by an obstructed view. 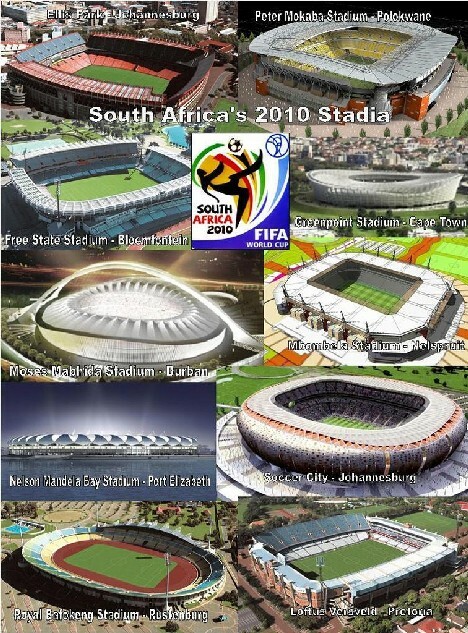 On June 11th, 2010, the Soccer City stadium will be the site of the 2010 FIFA World Cup’s opening match, with host team South Africa taking on Mexico! 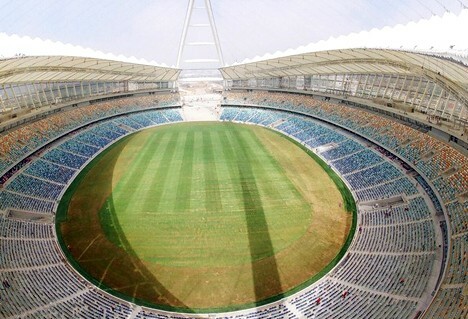 Opened on November 28th, 2009, Moses Mabhida Stadium was designed as a flexible facility with a nominal capacity of 54,000 that can be expanded to 80,000 if the need requires. 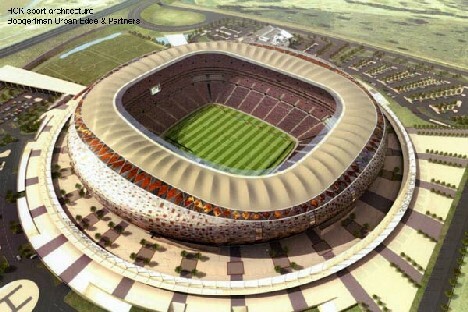 During the 2010 FIFA World Cup, the seating capacity will be set at 70,000 paid attendees. The extra seating is provided by an upper deck – the third of three – that can be quickly set up or knocked down. The stadium was named for Moses Mabhida, former General Secretary of the South African Communist Party who died in 1986. 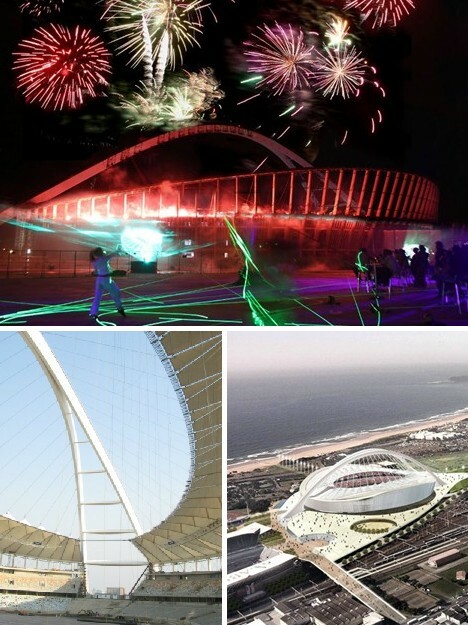 One wonders what Mabhida would think of the prominent capitalist tone of an event like the FIFA World Cup being hosted in a stadium bearing his name. 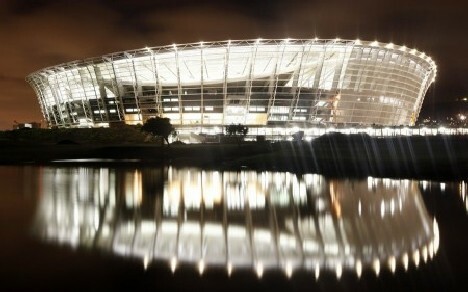 Moses Mabhida Stadium centers an integrated sports and recreation complex that includes an adjacent indoor arena, a sports education institute and a football museum. Access from Durban’s residential and business districts is made easier via a transmodal transport station. As for the stadium itself, the natural grass surface receives sufficient sunlight as the roof is not completely covered. 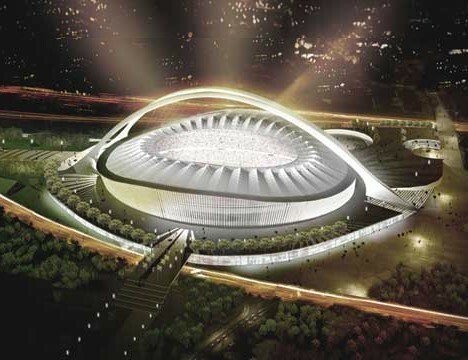 Instead, a design reminiscent of London’s iconic Wembley Stadium features a 350 meter (1,150 ft) long arch that both supports the sunshade-style roof and can be traversed with a central observation platform providing exceptional views across the city of Durban and the ocean just beyond. 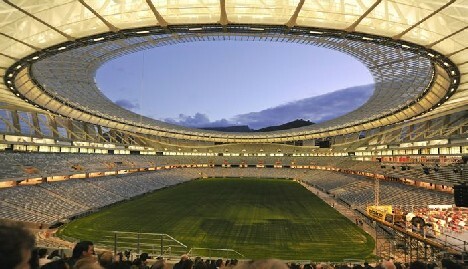 Green Point Stadium opened on December 14th, 2009 and was specially built with the upcoming World Cup in mind. The 69,070 seat stadium was built on the site of a previous arena. 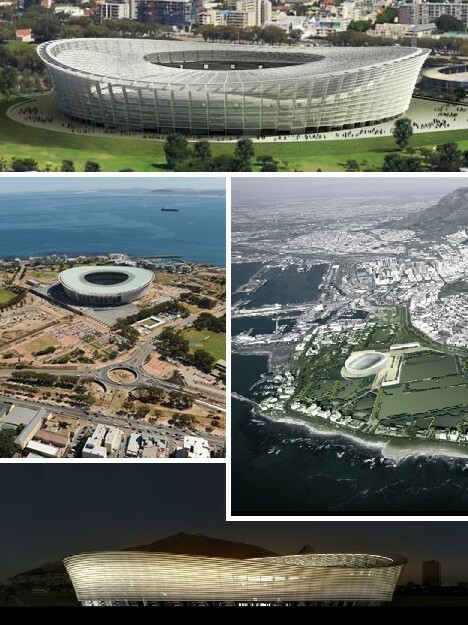 Designed to complement and enhance Cape Town’s thriving downtown, the new stadium is close to the shopping and entertainment district at the Victoria & Alfred Waterfront. Though situated in the heart of downtown, new Green Point Stadium is insulated from the city’s hustle & bustle (and vice versa) by a 60 hectare urban park. 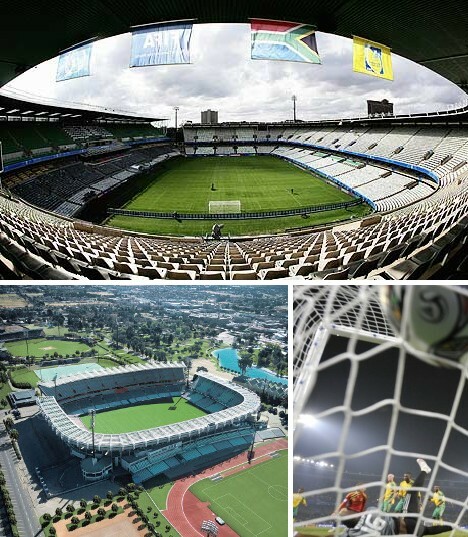 Over the month-long course of the World Cup, Green Point Stadium will host 5 first-round matches, 1 second-round match, 1 quarter-final match and a single semi-final match. The opening first-round match between Uruguay and France begins on the evening of June 11th, 2010. Ellis Park Stadium is a 62,567 seat multi-purpose stadium that opened in 1928… construction costs were a mere £5,000 GBP at the time. 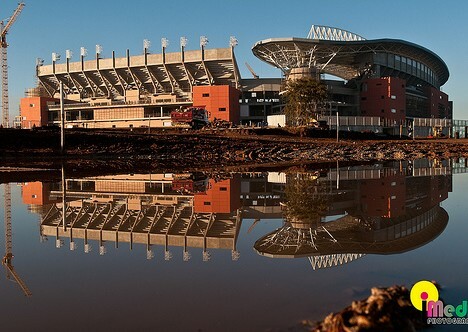 Fast-forward to 2008, when The Coca-Cola Company paid ZAR 450 million (US $58 million or £30 million GBP) for the naming rights – the stadium’s official name is now Coca-Cola Park. 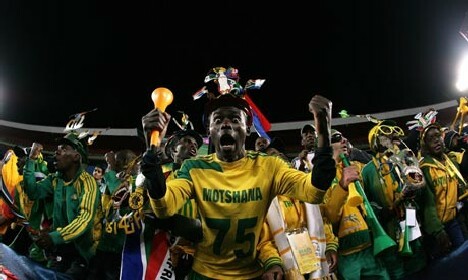 The stadium is also noteworthy for becoming, in 2005, South Africa’s first black-owned stadium. Several odd, unusual, even tragic events have tarnished Ellis Park Stadium’s aura over its 82-year history. One of the strangest took place on January 17th, 2007 when a linesman and 3 players were struck by sideline advertising boards blown onto the pitch by howling winds – luckily, none were seriously injured. Such was not the case in 2001, however, when fans stampeded during a Premier Soccer League game between the Orlando Pirates and the Kaizer Chiefs, resulting in the deaths of 42 people. 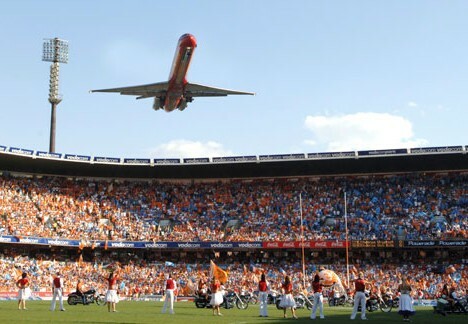 Loftus Versfeld Stadium has a capacity of 51,762 today but the site has hosted a wide range of sporting events since as far back as 1906. 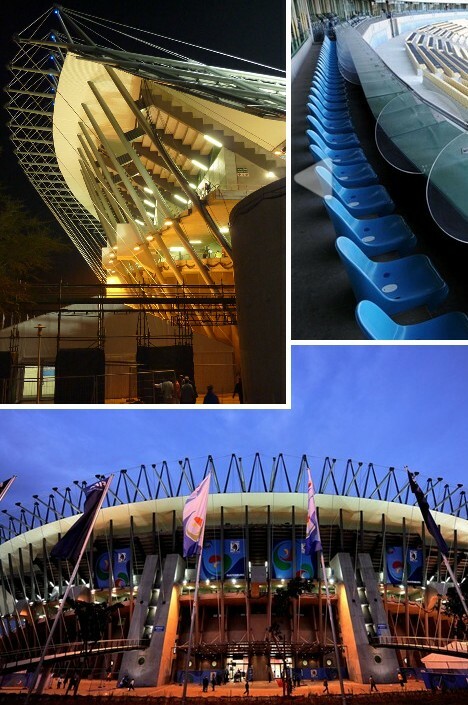 Its long history of frequent renovation and improvement served the stadium well in the run-up to the 2010 FIFA World Cup, as only minimal upgrades mainly affecting access infrastructure were required to bring the venue up to snuff. 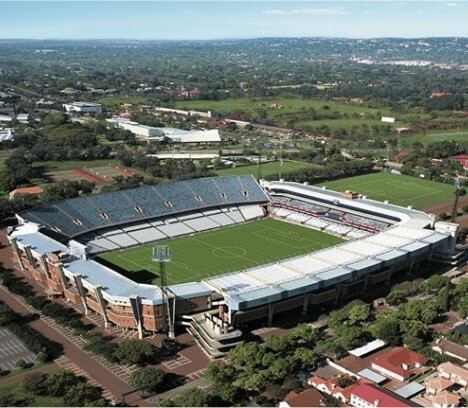 Loftus Versfeld Stadium will host its first World Cup game on June 13th, 2010 when Serbia and Ghana take the field. As the largest stadium in Pretoria, South Africa’s administrative capital, Loftus Versfeld Stadium is used for major entertainment events as well as sports matches and championships. The Close Encounters Tour featuring pop/reggae group UB40 and British pop star Robbie Williams drew over 56,000 on April 17th, 2006 and Canadian pop singer Celine Dion drew about 80,000 fans over the course of 2 consecutive nights in February of 2008. 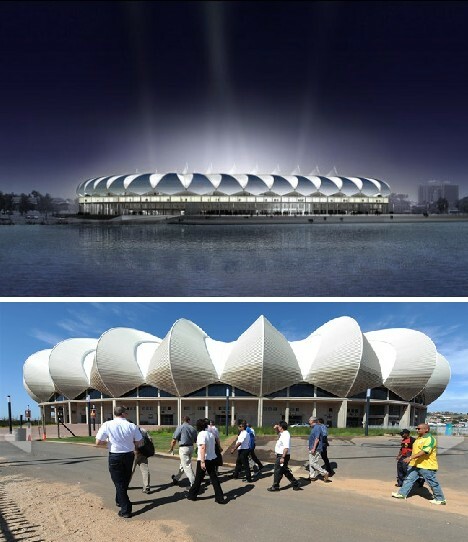 Nelson Mandela Bay Stadium is one of 5 wholly new stadiums built in South Africa expressly to host the 2010 FIFA World Cup, though it will undoubtedly provide residents of this beautiful seaside city with many years of use as a top-end sports and entertainment venue. The stadium has a capacity of 48,459 and provides soccer fans with a breathtaking view out over neighboring North End Lake. 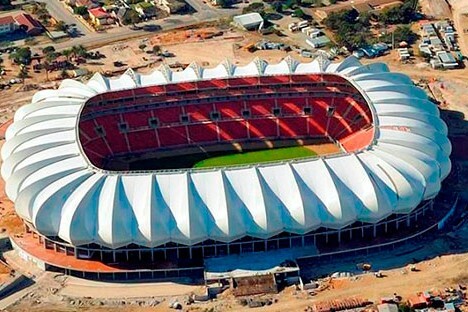 As a brand new facility, Nelson Mandela Bay Stadium had the advantage of being built utilizing state-of-the-art construction techniques and materials. The most outstanding feature is the roof, which appears to be made of interlocking white flower petals and has given rise to the stadium’s nickname, “The Sunflower”. 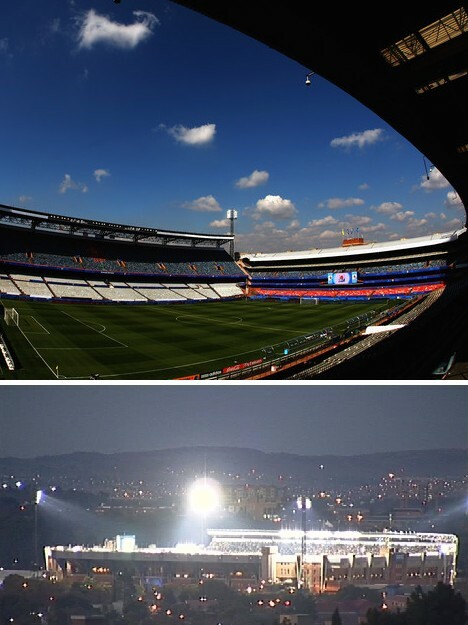 Inside the 40-meter (131 ft) high stadium are 6 levels of seats on the west side and 5 levels on the other 3 sides. 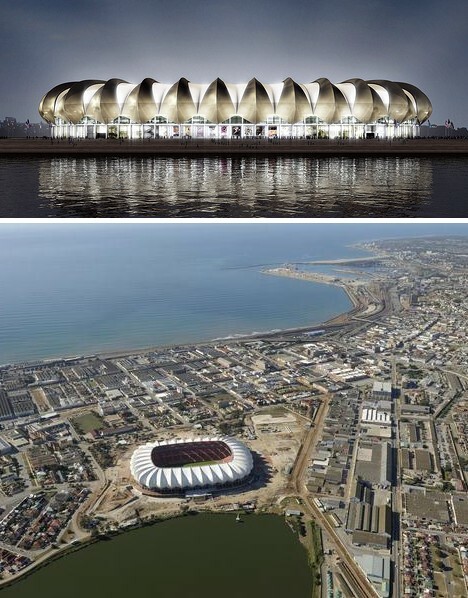 A total of 8 games will be played at Nelson Mandela Bay Stadium during the course of the World Cup with the first taking place between South Korea and Greece on June 12th, 2010. 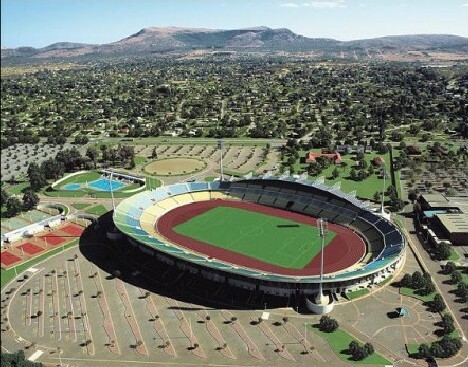 Free State Stadium (known alternatively as Vodacom Park) in Bloemfontein was originally built in 1995 and hosted the Rugby World Cup the same year. 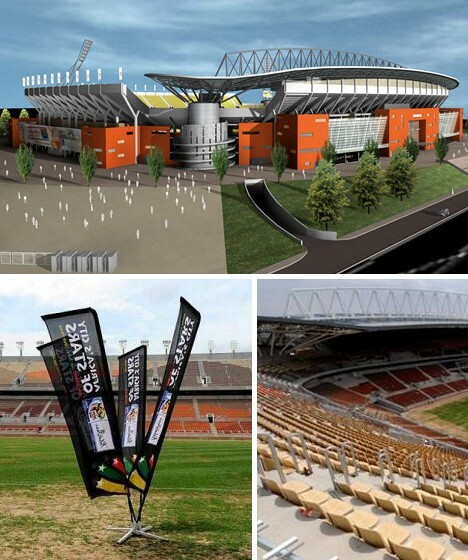 The stadium is home to a pair of pro rugby teams: the Free State Cheetahs and the Central Cheetahs, as well as Bloemfontein Celtic of the Premier Soccer League. 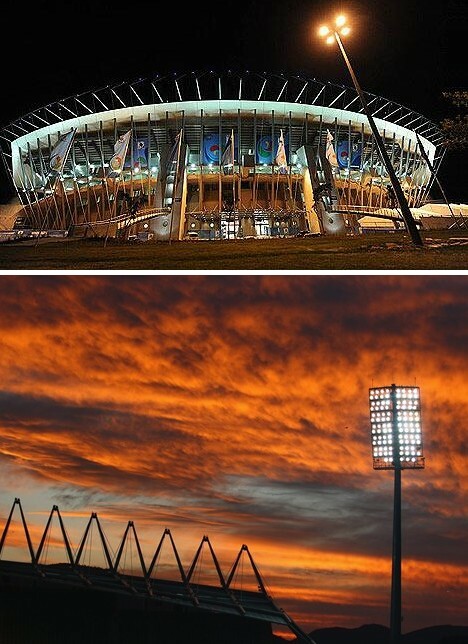 Though only 15 years old, Free State Stadium was extensively renovated in preparation for the World Cup. The most obvious (and most expensive) upgrade involves the addition of a second tier to the west side of the main grandstand. The new upper tier raised the stadium’s capacity from 36,538 to 48,000. Other improvements include new electronic scoreboards, improved lighting, a modern sound system and a revamped media center. Peter Mokaba Stadium is a brand new soccer stadium completed near the FIFA-imposed deadline for new construction in early 2010. 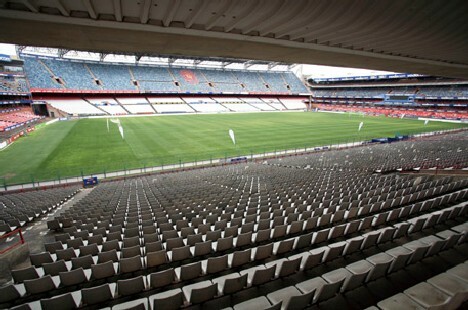 Located in Polokwane (formerly known as Pietersburg), Peter Mokaba Stadium is named for a former leader of the ANC Youth League and has a stated capacity of 46,000. 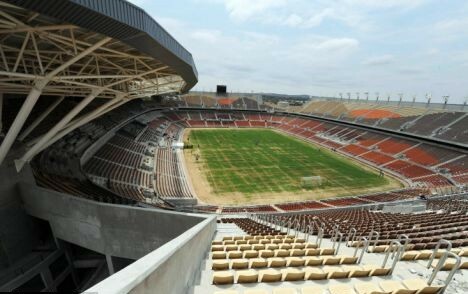 Four first-round matches will be played at Peter Mokaba Stadium during the 2010 FIFA World Cup, beginning with Algeria vs Slovenia on June 13th and closing with Paraguay vs New Zealand on June 24th. Peter Mokaba Stadium, along with Mbombela Stadium, features an innovative Desso GrassMaster playing surface composed of natural grass reinforced with synthetic turf fibers. 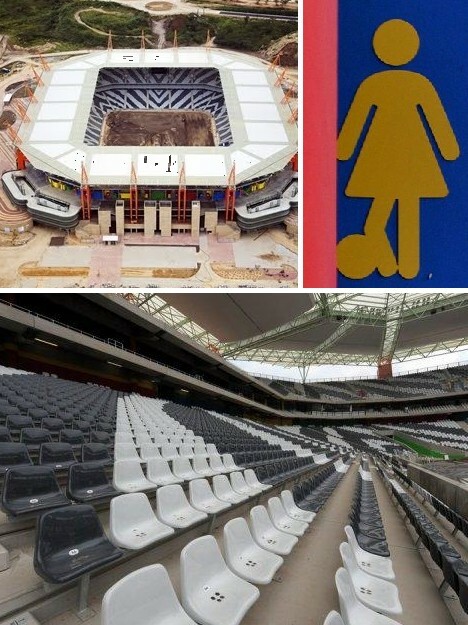 The games scheduled for these 2 stadiums will mark the first time in the history of FIFA that partially artificial playing surfaces will be used in World Cup matches. 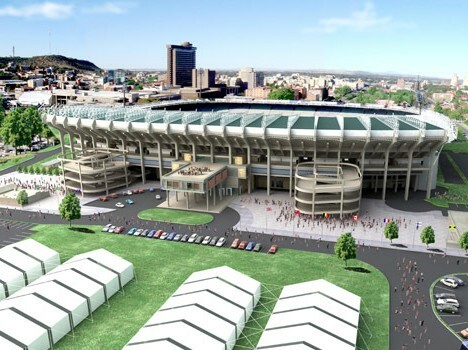 The Royal Bafokeng Sports Palace (to give it its official name) is an open-air, multi-use stadium owned by the The Royal Bafokeng Nation, the traditional community and ethnic homeland of the Bafokeng people since the 12th century AD. The stadium, completed in 1999, has been upgraded with a partial cantilever roof that provides relief from the sun to a portion of the west grandstand. 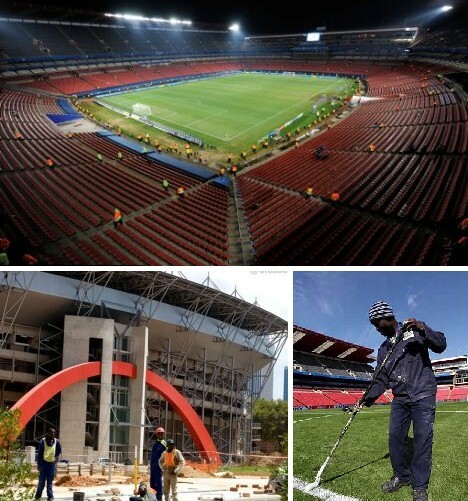 As with Peter Mokaba Stadium, a range of other upgrades including the scoreboards, lighting and sound system were instituted by the middle of 2009 to meet FIFA standards. 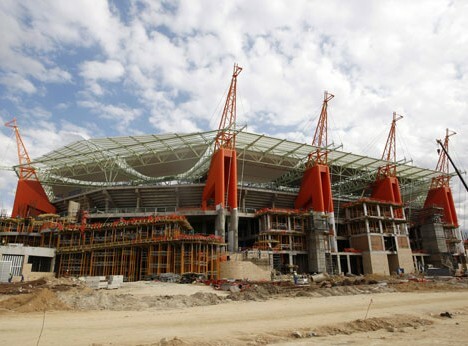 Royal Bafokeng Stadium, located in Phokeng near Rustenburg, South Africa, has a capacity of 44,530 as a result of new seats being installed in 2009. A total of 5 first-round matches and 1 second-round match will be played at the stadium, with England vs the USA leading things off on June 12th and a clash between the winners of Groups C and D scheduled for June 26th. 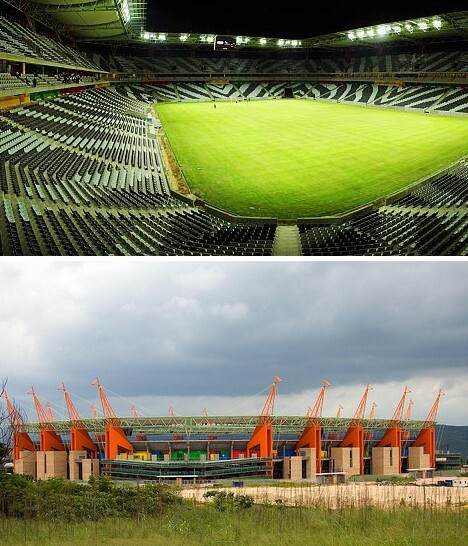 Although at 43,500-seats, Mbombela Stadium just west of Nelspruit, South Africa may be the most distinctive. The cantilever roof that shelters most of the seating area is supported by 18 structural members that outwardly resemble giraffes. This is no coincidence – Kruger National Park is located nearby and its expected tourists attended World Cup matches at the stadium will add sightseeing trips to Kruger to their itineraries. The wildlife theme is also reflected by the seats, which when unoccupied display a zebra-stripe pattern. 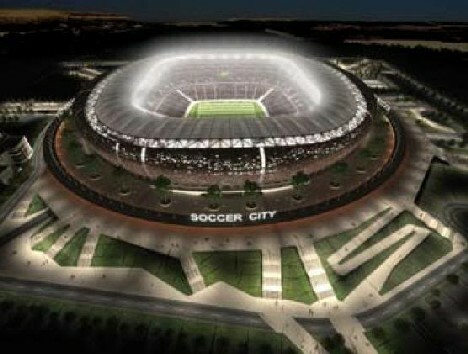 Construction on Mbombela Stadium began in February of 2007 and by November of 2009 the facility was pronounced complete. Only 4 first-round matches are scheduled to be played at the stadium over the course of the 2010 FIFA World Cup, beginning with Honduras vs Chile on June 16th, followed by Italy vs New Zealand on June 20th, Australia vs Serbia on June 23rd and wrapping up with North Korea vs Ivory Coast on June 25th. Though there’s nothing that can be done to reduce the long distances many football/soccer fans will have to travel to get to South Africa, once they arrive they’re sure to get their kicks!